You've begun attracting birds to your yard and now you want to attract more. Maybe you already have one simple seed feeder - what do you do next? The fastest and most reliable way to attract birds to your yard is with a normal birdfeeder for sunflower seed or a sunflower-based blend. 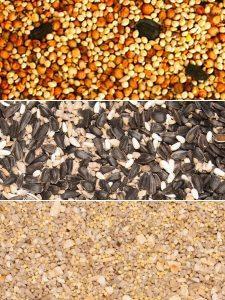 If you want to attract the most consistent and varied birds you do need to have good quality seed. Some big box/hardware store/grocery store/pet store seed blends are filled with cheap but inedible filler ingredients that birds won't eat, greatly reducing the birds you'll see and creating a rodent-attracting mess instead. If your seed looks like the top picture to the right, you're in trouble and should consult a specialist (that's us). If it looks like the middle one, with lots of black sunflower and no fillers, you're doing fine. If it looks like the last one (our No-Mess Blend) you've pretty much maximized your seed feeding, using hulled sunflower chips that attract the greatest variety of birds with no waste. Come talk to us about choosing good seed, or start by reading our Seed Page. 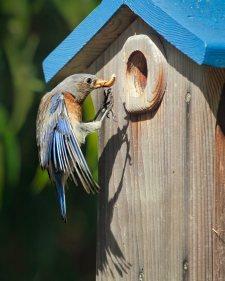 Bluebird bringing mealworms to box. Local picture by Christine Hansen. 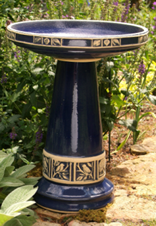 Birdbaths appeal both to the birds visiting your feeders and to others. Some birds such as robins, flickers, mockingbirds, or phoebes are common yard visitors who very rarely come to any feeder, but will come to baths. Bird houses and nesting material can attract different birds during the nesting season, ranging from common songbirds to owls. Developing your backyard habitat with appropriate plants will increase the birds you attract to your yard. Native plants often produce plants or fruit that native birds recognize as food sources. Multiple layers of cover provide useful shelter or nesting sites. One of the most important elements in adding to your yard list is increasing your awareness of the local birds. Get a field guide and learn to recognize the common species in your yard. Sit outside or open your windows on nice days and practice connecting the bird songs or calls you hear with a visual identification. 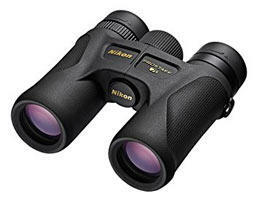 Get a pair of binoculars and keep them someplace handy where you will look at the birds at your feeders. Do these things and you will be more likely to spot newcomers when they arrive.